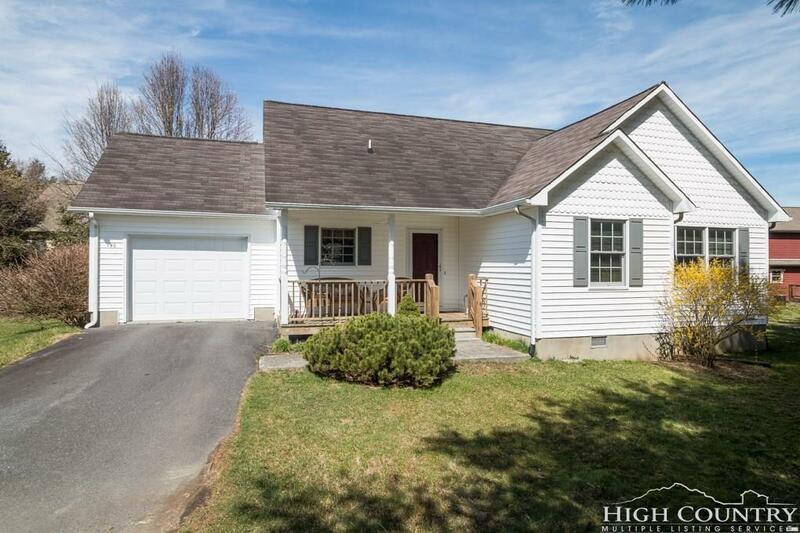 Very appealing single level cottage in Boone with 3 bedrooms and 2 baths. This home is in a neighborhood convenient to Samaritan's Purse, the hospital, the new health sciences school and the Boone Golf Course as well as ASU. From the front covered porch you enter a lovely home with vaulted ceilings and an open living room area with a stone wood burning fireplace. There is an open back deck off the living room and dining room to enjoy the outside and watch the birds. The kitchen has a nice amount of granite counter space and a breakfast counter. The spacious master suite has large windows, a walk in closet and nice bath with vaulted ceiling, whirlpool tub and separate shower. There are two other bedrooms, one with a vaulted ceiling, and a full bath. This home has a surprising amount of lawn space that could be used for gardening or play areas. The attached garage is great to have here in the High Country and is just one step into the dining area. New heat pump in 2015, clean space in crawlspace. Be sure to look at the 3-D virtual tour with this listing!